Want a tasty, quick, and nourishing ramen noodle dish? 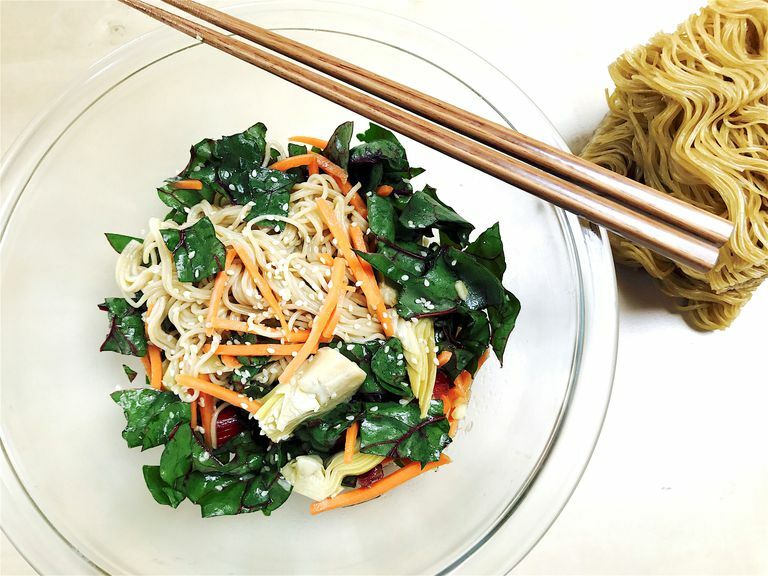 Try this millet and brown rice ramen vegetable medley jam-packed with whole grain goodness and brain-healthy leafy greens and other vegetables. Leafy green vegetables like the Swiss chard in this dish are emphasized in the MIND diet as they provide folate, vitamin E, carotenoids, and flavonoids, which have been related to lower risk of dementia and cognitive decline in studies. A daily dose of leafy greens has shown to have the strongest protective effect for brain health—equal to one and a half years younger! Plus, the whole grains in this dish provide ​brain-healthy nutrients, vitamin E, and other antioxidants, which can help keep your brain functioning in tip-top shape. To make ramen, add two cups of water to a large pot and place over high heat on the stovetop. Bring to a rolling boil and gently drop in the ramen cake. Allow it to cook for a minute, separating gently with a fork. Turn heat down to a gentle boil and allow to cook for three minutes, stirring occasionally. Drain in a colander in the sink. Place cooked ramen in a large bowl. Toss in chard, artichokes, and carrots. Whisk together oil, soy sauce, lemon juice, and garlic. Drizzle over ramen and vegetables. Gently toss. Divide ramen and vegetables into two bowls. Top each one with sesame seeds. Enjoy! If you like things spicy, add heat with Sriracha or diced jalapenos. They won't affect the calorie count of the dish too much. You can also toss grated ginger root into the sauce. Use black rice ramen for a colorful twist. Add sliced zucchini, mushrooms, or a variety of greens like spinach, arugula, or bok choy for a varied vegetable experience and even more nutrients. Make this dish into a ramen soup by saving the water that the noodles are cooked in; toss in the sauteed vegetables and stir gently. Serve this hot or cold. Save the leftovers in the fridge for a few days and serve as is or reheat in the microwave.